YRC Worldwide is dodging bullets, but it can’t stop dancing. Despite a victory in court last month, the less-than-truckload operator still faces battles with its competitors for business and its own finances. 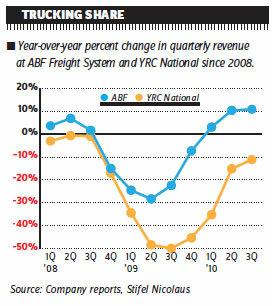 ABF is regrouping after losing its first round of litigation with YRC and the Teamsters union. The company shocked the shipping world when it challenged its rival’s concession agreements with the Teamsters union in court — a step even ABF President Wes Kemp admitted in November was “out of character” for the 87-year-old LTL carrier. “I just want to see the playing field leveled,” Kemp told reporters at the Transcomp/Intermodal Expo in Fort Lauderdale, Fla. The abrupt dismissal of the case — after a four-hour hearing Dec. 16 — by U.S. District Judge Susan Webber Wright left the Arkansas Best subsidiary with limited maneuvering room in an uneven and increasingly expensive LTL landscape. For YRC, the decision didn’t change the $850 million in long-term debt on YRC’s balance sheet and the deteriorating revenue stream from its operations. YRC Worldwide must begin beating ABF and other competitors to customer loading docks if it is going to make good on the chance for recovery offered by the Teamsters union and its lenders. And what a chance they’re offering. In the agreement approved last October, the Teamsters extended a 15 percent wage cut at YRC, Holland and New Penn through 2015, and agreed to a 75 percent reduction in company pension contributions. Those pension contributions have been suspended since August 2009, and will resume at only 25 percent of their July 2009 level next June. The whole package of concessions will last through March 2015, instead of March 2013, saving YRC Worldwide an estimated $350 million a year on top of what it’s already saved. That’s why ABF filed its lawsuit Nov. 1 claiming all three rounds of concessions at YRC were illegal and asking the court to award it $750 million in compensatory damages. The Teamsters concessions to YRC saddled ABF with the highest labor costs in LTL trucking, and the carrier couldn’t win relief from its own employees. The Teamsters exacted a stiff price for extending their steep concessions, claiming an unprecedented role in decision-making by YRC management to ensure the protection of union jobs, including a second seat on the company’s board. Last month, the company was racing to find $300 million in new investment or convince its lenders to agree to a $300 million debt-for-equity swap by Dec. 31, as required by the latest Teamsters pact. The potential for the Teamsters National Freight Industry Negotiating Committee to extend that deadline meant YRC wasn’t heading for the same stone wall it faced when struggling to convince bondholders to accept an unpopular $464 million debt-for-equity swap last year. The contract agreement calls for YRC to work with its lending group to restructure its debt in 2011 as well, and gives the Teamsters veto power over their decisions. Without further concessions from union employees — considered highly unlikely at this point — both ABF and YRC will have to take their fight to the pavement. This year will put the entire LTL industry to the test, in some ways more than 2010. YRC’s survival to this point ensures carriers will have to run leaner operations geared more toward profit than chasing and gaining business. This is the first recovery cycle, in fact, when a major LTL carrier hasn’t shut down, throwing pricing power to the carriers and setting off a scramble for a market share dominance. When Consolidated Freightways shut down just before Labor Day 2002, it sucked excess capacity out of the system and dropped hundreds of millions of dollars in freight onto the market overnight, and LTL prices spiked sharply. Without that kind of stimulus in 2010 and 2011, carriers are falling back on restructuring networks, consolidating terminals and increasing direct loading to reduce costs, while culling unprofitable freight from their books. That’s led to a slow improvement at Con-way Freight, FedEx Freight, ABF and other carriers. But if anecdotal reports of higher-than-expected retail sales and stronger over-the-road freight traffic in the fourth quarter prove true, YRC Worldwide and other less-than-truckload carriers may start this year in a better position than expected.